« The GSC Sales Team 4700km Japan Journey! I’ll be taking over the blog for Mikatan today, and I’ve decided to take a look at some of the figures from a series that I look forward to every week! The last episode of the series is going to air later this week, so I thought I’d take a look at some of the upcoming and released figures from the series! First up let’s take a look at figma Saber, in her lovely black suit that she was known for in the Zero series. She was just recently announced for a rerelease which will be coming in October! The suit itself is made from a soft material allowing you to pose her in all sorts of wonderful poses! figma Emiya is currently up for preorder to be released in September this year! He comes with a load of heavy weapons along with his Thompson Contender, and he even comes with a hand holding a cigarette and an expression with a cigarette in his mouth – all the optional parts really bring together Kiritsugu’s personality! He even comes with a extra arm part that lets you display him with one hand in his pocket – it’s the perfect pose for him in my opinion! ex:ride Spride.05 : Saber Motored Cuirassier! You can of course also pose figma Saber: Zero ver. riding the bike, allowing you to recreate the amazing scene from episode 20 of the anime series! 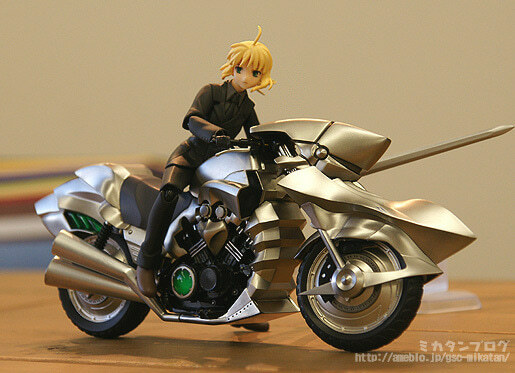 The bike also comes with an extra head part for figma Saber that makes it look like her hair is blowing in the wind, as well as a hand part for her to grip onto the handle bars. Here we have all the different versions of Saber and her bike – the 1/8th scale version will be released later this month. Both the scale figure and the figma have their own unique feeling – I love putting different scale figures together like this and comparing them! But… where did that Nendoroid come from…? She was on display at NicoNico Super Kaigi so I’m sure most of you already knew about her, but the black suited Saber will be joining the Nendoroid world as well! Because this was a special on Fate/Zero figures, I had to beg Oda-P to let me include the unfinished version in this post – but note that it is still incomplete and may still have some changes made! The painted version along with all her optional parts will be introduced shortly, so look forward to it – I’m sure Mikatan will give her a proper introduction with lots of photos! I also want to introduce this figure of Saber! The 1/7th Scale, Saber ~Triumphant Excalibur~! This figure has also been announced for rerelease this September! Saber wore this classic armor in Fate/Zero as well, so fans of the original Fate/stay night and fans of Fate/Zero will love this figure! The long flowing fair and realistic looking armor are absolutely stunning! Anyway, that brings an end to my Fate/Zero figure special! If you enjoy the anime then don’t miss out on the figures! Lastly, a look at another upcoming figure! The 1/8th Scale, Princess of the Crystal! Her huge fluffy dress that gives the figure some nice volume along with the all-important penguin hat have all been faithfully sculpted as not to disappoint fans of the series! The pose itself is also lovely to look at – you can see all her lovely curves and the expression is perfect! She is available for preorder as of tomorrow! Phew, I managed to finish the blog… I can’t tell you how much pressure I was under to write this… thanks for reading the whole thing! Perhaps I’ll see you all again sometime!! It seems I’ve been roped into writing again tomorrow! I’ll be taking a somewhat different look at introducing a certain set of figures to everyone – I hope you’ll enjoy it.